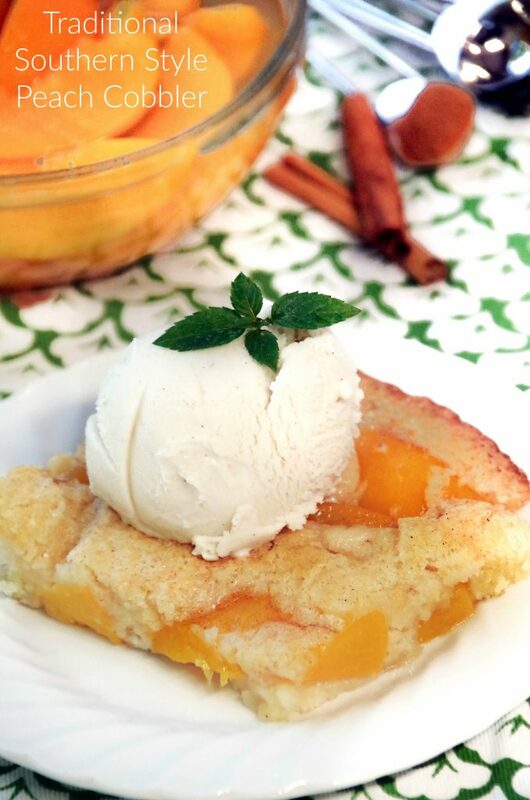 Home » Recipes » This Southern Peach Cobbler Recipe is a Delicious Ending to Any Meal! 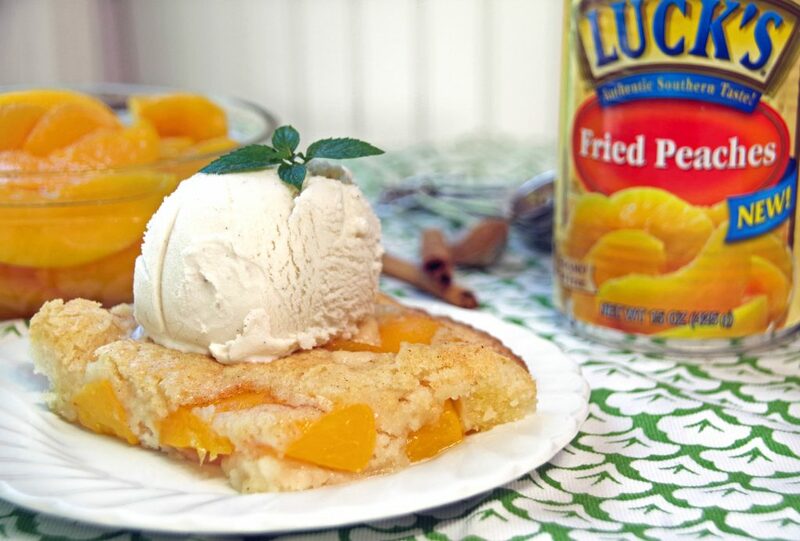 This Southern Peach Cobbler Recipe has been sponsored by Luck’s. Product for this recipe was provided by Luck’s but all ideas are my own. When I moved to the south 20 years ago, I quickly realized that southern food is VERY different from the food I ate in New England. I discovered that there are people who like boiled peanuts. And that I am not one of them! I also discovered that okra is best eaten fried and that chicken fried steak is the most delicious thing my mouth has ever tasted! You know what else I came to love? Peaches. Nothing says southern quite like the flavor of peaches! One of my favorite ways to enjoy peaches is baked into a traditional southern peach cobbler recipe. 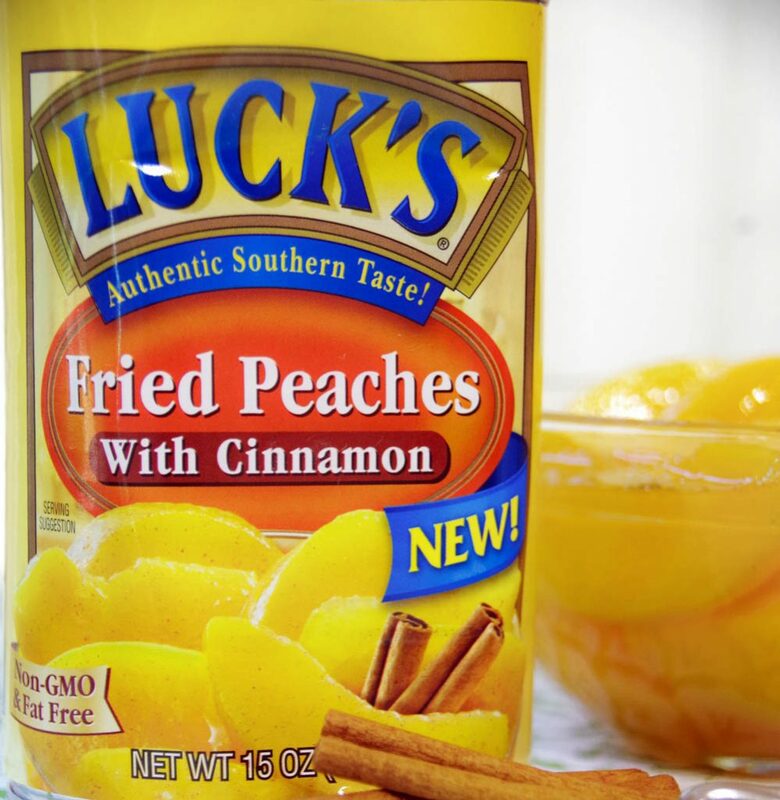 When I was asked to partner with Luck’s to showcase their traditional canned fried peaches, I knew this was a perfect fit! Growing up in New England, my favorite dessert was an apple crisp. Well, here in the south, ‘crisps’ are not really a popular dessert recipe. Here in Georgia, peach cobbler is just about the most traditional southern dessert you can make and it is delicious! Back in the olden days, cobblers were the trail version of a pie. Basically, it was a dessert that you could cook over an open fire that provided a little bit of that ‘home cooked’ feel. As a family, we used to make cobblers over the campfire when my son was in Boy Scouts and it was definitely much loved by the kids! This southern peach cobbler recipe is very similar to the one we used when cooking over a campfire and is very easy to make. Luck’s has been around since 1947 and has its roots in the South. Their products offer a traditional southern taste for distinct and delicious dishes that anyone can learn to love, even THIS girl who was born and raised up north! Fresh peaches are delicious but the growing season is short and they go bad quickly. Using canned peaches for this southern peach cobbler recipe makes it a delicious dessert option all year, not just in the heat of summer. Canned fruits also have the added benefit of ease of preparation without having to peel and slice. That is a huge perk when you are in a hurry! There are a couple of important things to remember when making a traditional southern peach cobbler. You will need to melt the butter IN the 13 by 9-inch pan and then pour the batter on top of the butter. You must not stir the butter into the batter! Seriously…just pour the batter mix right into the hot pan with melted butter and leave it there. You will also need to remember to drain the canned peaches. This is incredibly important! You will end up with a gloppy mess if you pour all the juice in there. And finally, you must serve this southern peach cobbler recipe with a scoop or two of high-quality vanilla ice cream. That is just an absolute requirement for a classic southern experience! 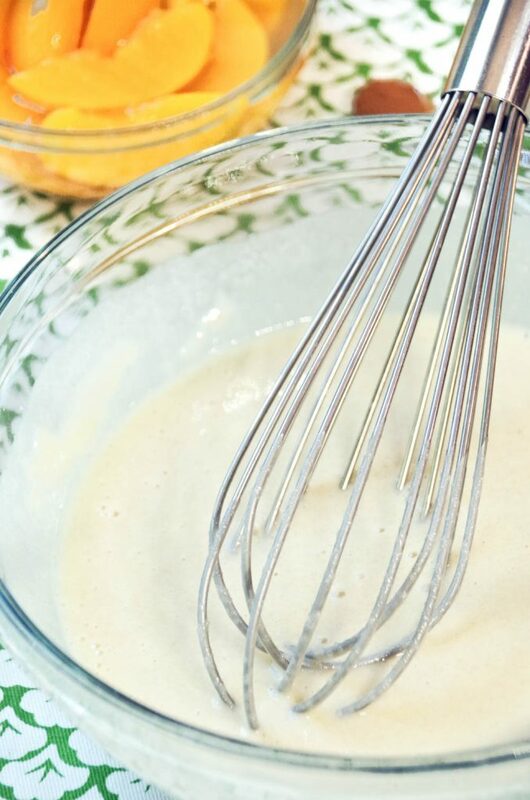 You can get more delicious recipes on the Luck’s recipe page and you can print a coupon for Luck’s if you want to explore more traditional southern recipes in your kitchen. 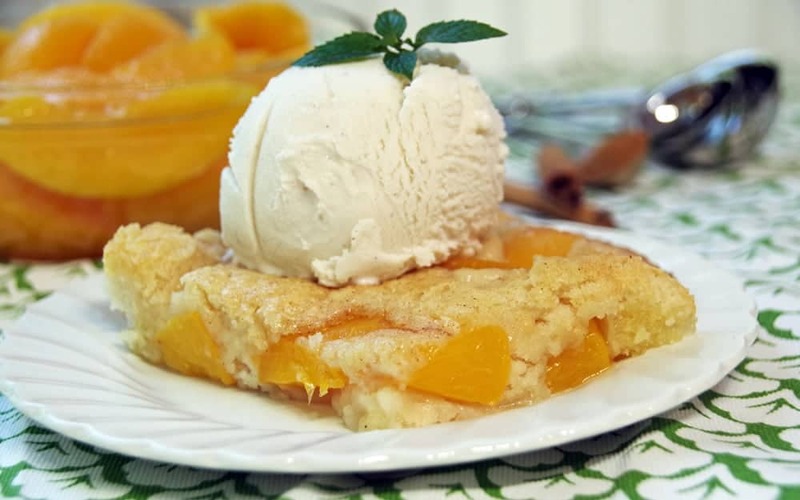 Here is a very traditional southern peach cobbler recipe. I added a sprinkle of cinnamon and sugar on top before baking but you can skip this if you prefer. Looking for a traditional southern dessert? 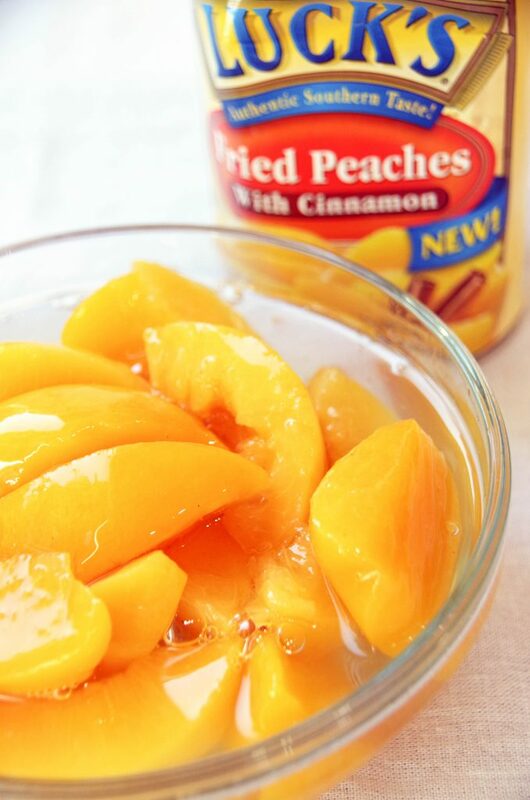 This southern peach cobbler recipe with canned peaches is easy and delicious! In a large bowl, combine the flour, sugar, baking powder, salt, and milk. Mix thoroughly. Remove the pan from the oven and pour the batter over it. DO NOT STIR. Carefully place the peaches on top of the batter. Again, DO NOT STIR. Bake at 375 degrees for 25 to 30 minutes or until the crust is deep golden brown and toothpick inserted in cake comes out clean. 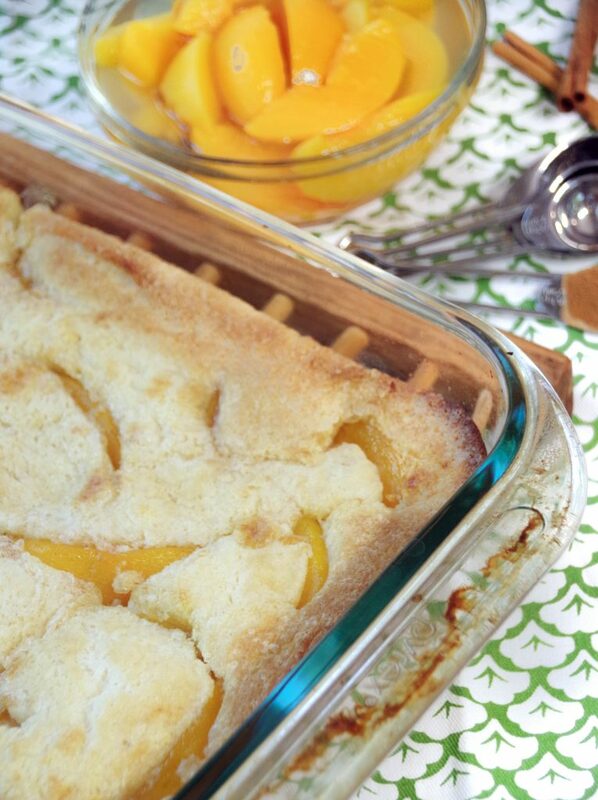 Like this traditional southern peach cobbler recipe? Pin it for later!